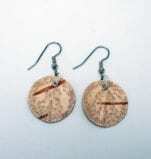 These earrings are cast from silver in cuttlefish bone. Turquoise cabochons add a dash of color. "Like two sides of the same coin, Nurtured by Prayer wears both the masks of Sunset and Sunrise. They are sisters born of the same characteristics yet they remain unique. The headpiece of Sister Sunset bears the stars and the vastness of the universe while the headpiece of Sister Sunrise displays the radiance of the sun's rays from dawn to dusk. Sister Sunset wears the rays of sunlight upon her chin as she awakens during the last moments of day. Conversely Sunrise Sister has a star upon her as the last vestige of night fades into day. The sisters' mouths are extended in song softly and continually yielding praise and thanksgiving to our Creator." Joe Cajero Jr. Each earring is approximately 1 inch wide x 1 1/4 high, including the ear wire. All material is sterling silver. The symbols are in bas relief against an oxidized background. The dark background is more uniform than the images show; the camera picks up reflections that are generally not visible to the human eye. 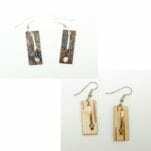 David Gaussoin Steel Dangle Earrings David Gaussoin, of the renowned Gaussoin jewelry innovating family, has created a fun pair of earrings. The sterling silver half-round shape is concave; the steel dangles hanging down create a striking visual effect as the wearer moves. 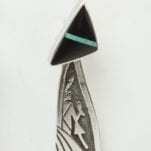 Gaussoin's hallmark is stamped on the reverse, convex side. One could wear the earrings with this side out if preferred. The earrings are 3 5/8 inches from top of ear wire to bottom of steel; 1 inch wide. Sterling silver earrings with overlay birds and flowers of 14K Gold and small turquoise cabochons. Various stamps adorn the earrings. 14K may be gold fill, rather than solid gold. 1 3/8 inches wide x 2 inches high from bottom of earring to top of ear wire. 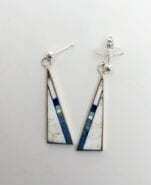 Earrings are thin and light. c. 4th quarter 20th century. Sterling silver earrings stamped with multiple designs (stars, clouds, lightning), pebbled surface, chrysocolla cabochons, and feather-like dangles that create a pleasant sound if shaken. 2 1/2 inches high x 1 1/4 inches wide. Sterling silver posts; stamped with a hallmark that resembles a stylized letter "P", but could have another meaning. c. 4th quarter 20th century. 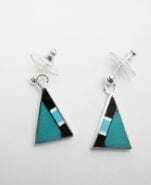 Master designer and silversmith Earl Plummer has created sterling silver earrings inlaid with natural turquoise from the Kingman mine in Arizona, with varying shades of blue, ochre, and white. Earrings are 1 3/8 in. high; 2 3/16 in. from top of ear wires to bottom of earring; 1/2 in. at their widest; 3/16 in. deep. From the secondary market, we have a pair of sterling silver post earrings adorned with a dancing figure and inlaid with turquoise and black marble. 2 1/4 inches high x 3/4 inches wide. Stamped with initials R B; c. 4th quarter 20th century. Master designer and silversmith Earl Plummer has created elegant oval shaped earrings with a background of natural turquoise and a second level of inlay, including red and orange spiny oyster shell, lapis lazuli and turquoise. Earrings are 1 3/8 in. high; 2 1/4 in. from top of ear wires to bottom of earring; 7/16 in. at their widest point; 3/16 in. deep. 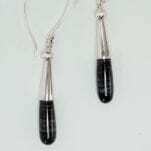 Master designer and silversmith Earl Plummer has created elegant, long earrings, inlaid with gaspeite in sterling silver; sterling silver ear wires. Earrings are 1 3/8 in. high; 2 in. from top of ear wires to bottom of earring; 2 in. at their widest point; 3/16 in. deep. 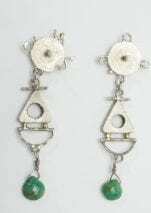 Master designer and silversmith Earl Plummer has created elegant, long earrings, inlaid with variscite in sterling silver; sterling silver ear wires. Earrings are 1 3/8 in. high; 2 in. from top of ear wires to bottom of earring; 2 in. at their widest point; 3/16 in. deep. These earrings are a combination of a cuttlefish bone cast design and crazy lace agate cabochons set in sterling silver with spiral designs on the back and scallop-edged bezels holding the stones. The wavy lines in the cast silver echo the "crazy" waves in the stones. Each stone has a translucent area that shows the polished silver setting below. 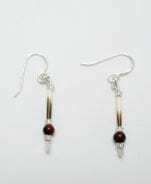 These are post earrings, with a clip as well as a sterling silver backing for extra safety. 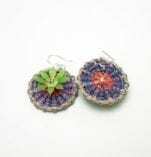 LaKota Scott Desert Lily Basket Earrings Navajo artist Lakota Scott honors her Nation's tradition of basket weaving, with a twist: she weaves copper wire to create colorful basket jewelry. White, red, and black make for a sharp contrast in color, and a strong statement. Each earring is approximately 1 1/4 in. diameter x 3/8 in. deep. Margaret Jacobs Post earrings Margaret Jacobs makes boldly colored jewelry with a contemporary flair. These are post earrings with concave colored discs. Diameters 5/16" to 3/8"
These earrings are made from cuttlefish cast sterling silver, which gives them wonderful texture, with alternating shine and shadow. The cabochons are greenish-gray septarian with beautiful veins. 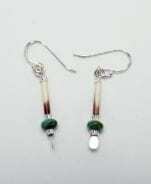 The coloration is elegantly understated, so the earrings can be worn with many styles, and for many occasions. Heidi BigKnife Seahorse Earrings These earrings are hammered in such a way that their surface resembles the skin of seahorses. The soft matte finish helps the resemblance to these charming marine animals. 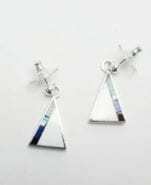 The earrings are made from argentium, an alloy that contains 92.5% silver (same as sterling silver) but is highly tarnish resistant, to preempt the need to polish. Seahorses are 1 7/16" high; earrings are approximately 2 1/4" high including the 18K gold ear wires. 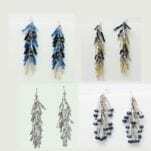 Heidi BigKnife Genetic Memory Earrings - Elk Teeth Heidi BigKnife's genetic memory series has grown out of the connections she feels with the history of the Shawnee and her family. The horsehair signifies both the importance of the horse to the Shawnee and human hair – hair that carries our DNA, our genetic memory. She describes the figurative shapes she uses in this series as “dresses” – having a feminine connotation, but others see them as “tunics” – masculine representations. 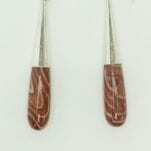 On these earrings, elk teeth represent an a decorative element of great importance. The earrings are 7/8" wide x 3/4" high. The matte finish gives the sterling silver a soft look, reminiscent of well-worn cloth. Heidi BigKnife Genetic Memory Earrings - Circles Heidi BigKnife's genetic memory series has grown out of the connections she feels with the history of the Shawnee and her family. The horsehair signifies both the importance of the horse to the Shawnee and human hair – hair that carries our DNA, our genetic memory. She describes the figurative shapes she uses in this series as “dresses” – having a feminine connotation, but others see them as “tunics” – masculine representations. The earrings are 7/8" wide x 3/4" high. The matte finish gives the sterling silver a soft look, reminiscent of well-worn cloth. Kingman turquoise cloud earrings: Amelia Joe-Chandler combines traditional cultural elements with a contemporary sense of design. She does not use any polish on her silver; as a result, the matte finish of her work is very distinctive and the artist's hand is evident in every piece. This pair of sterling silver cloud earrings include brilliant blue Kingman turquoise cabochons. Read about Amelia Joe-Chandler here. Earrings are 3/4" wide s 1" high; 1 3/4" high with handmade ear wires. Each of Amelia Joe-Chandler's pieces comes with an illustrated card that describes the materials and the story depicted. Amelia Joe-Chandler combines traditional cultural elements with a contemporary sense of design. She does not use any polish on her silver; as a result, the matte finish of her work is very distinctive and the artist's hand is evident in every piece. Joe-Chandler's window earrings are named after the triangular opening at the top. Beautiful coral cabochons complement the matte silver beautifully. Earrings are 1/2" wide; 1" high (1 1/2" from top of handmade earwires to bottom). Amelia Joe-Chandler combines traditional cultural elements with a contemporary sense of design. Amelia does not use any polish on her silver; as a result, the soft matte finish of her work is very distinctive and the artist's hand is evident in every piece. 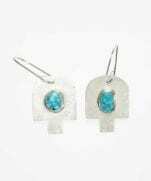 These sterling silver earrings are based on old medicine man earrings, which were traditionally made with turquoise. Amelia''s design is an elegant silver version. 5/8" wide x 7/8" high; these are post earrings. 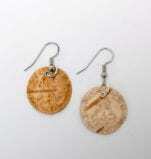 These earrings are made from cuttlefish cast sterling silver. They are extremely elegant, with freshwater pearls and silver posts. 1 1/2", top to bottom; 3/8" wide at bottom, tapering to 5/16" at top. These grass earrings are made from biclad metal: a layer of gold bonded to a layer of silver. 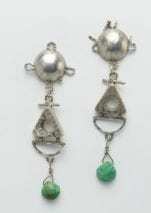 The earrings are folded to resemble a blade of grass; the second image shows a side view, with the silver showing on the inside. A faceted tsavorite garnet adds a beautiful, sparkly touch. 1 1/2" tall x 1/4" at the widest point. Heidi BigKnife Rhodolite Earrings These sterling silver earrings, in the shape of a dogwood leaf, have a dangling faceted rhodolite garnet set in bezel. The garnet has a lovely pinkish/purple tinge. The "leaves" are concave; the earwire latches on a hook on the reverse side, for added safety. The silver has a silky brushed finish. 1 1/2" from top of earwire to bottom of garnets; 5/8" wide. Master designer and silversmith Earl Plummer has created beautifully colored teardrop earrings with heavily matrixed natural turquoise, lapis lazuli, and coral. Earrings are 15/16 in. high; 1 3/4 in. from top of ear wires to bottom of earring; 3/16 in. deep. 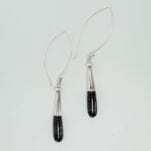 Chris Pruitt Sterling Silver Diamond Earrings Christopher Pruitt has won a number of awards in his rising career, including Best of Classification for jewelry at the Santa Fe Indian Market. This is a stunning pair of earrings with three distinct textures: the silver along the edge shines brightly; the diamond sparkles, and the cobbled texture of the overlaid silver provides a background of shadow and highlights to set the diamond off beautifully. 14K bezel holds the diamonds. 1 3/16 wide x 1 3/16 high plus 1/2 inch for the handmade ear wires. 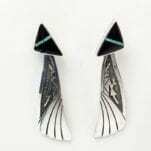 Navajo artists Herb and Veroncia Thompson created a beautiful pair of small triangular earrings inlaid with white buffalo, turquoise, and jet. 1 1/16 in. high x 1/4 at their widest. Navajo artists Herb and Veroncia Thompson created a beautiful pair of small triangular earrings inlaid with white buffalo, sugillite, turquoise, jet, and lapis lazuli. 1 1/16 in. high x 1/4 at their widest. Navajo artists Herb and Veroncia Thompson created a beautiful pair of triangular earrings inlaid with white buffalo, crazy horse, turquoise, lapis lazuli, and jet. 1 1/4 in. high x 7/16 at their widest. Master designer and silversmith Earl Plummer has created elegant, long earrings, inlaid with Sleeping Beauty turquoise, spiny oyster shell, lapis lazuli, coral, and sugillite in sterling silver; sterling silver ear wires. Earrings are 1 3/8 in. high; 2 in. from top of ear wires to bottom of earring; 2 in. at their widest point; 3/16 in. deep. Mary Tafoya Stacked Earrings 2 Mary Tafoya creates innovative designs in mosaic which sets her apart from most other Santo Domingo pueblo artists. In addition to design quality, the use of jet in her adhesive creates a wonderful contrast of black with materials. of many colors. 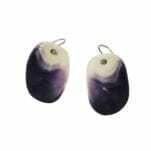 These beautifully colored earrings consist of carved stone stacked vertically. They are backed by dark serpentine stone, another of Tafoya's unique touches. In her work, Tafoya uses various kinds of shell, turquoise, alabaster, gaspeite, jet, black jade, pipestone, and more. Various of these materials are represented in these earrings. 1 in. high (1 1/2 in. from top of ear wires to bottom of earrings) x 1/4" wide x 1/4" thick. Coren Conti Peppermint jasper earrings Teardrop shaped peppermint jasper stones, combined with a sterling silver cap and leaf shape ear wires create an elegant pair of earrings. Athabascan artist Coren Conti, transplanted to Arizona for a number of years, favors stones from the southwest in her jewelry designs. Earrings are 2 in. high x 1/4 in. wide; including ear wires, height is 3 3/4 in. 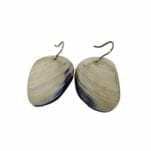 Coren Conti Zebra jasper earrings Teardrop shaped zebra jasper stones, combined with a sterling silver cap and leaf shape ear wires create an elegant pair of earrings. Athabascan artist Coren Conti, transplanted to Arizona for a number of years, favors stones from the southwest in her jewelry designs. These jasper stones are very dark green to the point of looking black in some light, with light horizontal bands. Earrings are 1 1/2 in. high 1/4 in. wide; including ear wires, height is 3 1/8 in. LaKota Scott Dune Sunflower Basket Earrings Navajo artist Lakota Scott honors the Navajo Nation's tradition of basket weaving, with a twist: she weaves copper wire to create colorful basket jewelry. Gold, blue, and brown wires create a stunning, deep color combination. Each earring is approximately 1 1/8 in. diameter x 3/8 in. deep. 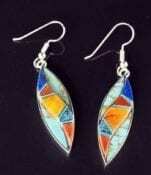 Mary Tafoya Double Side Mosaic Earrings Mary Tafoya creates innovative designs in mosaic which sets her apart from most other Santo Domingo pueblo artists. In addition to design quality, the use of jet in her adhesive creates a wonderful contrast of black with materials. of many colors. These beautifully colored earrings consist of a centerpiece stone with small rectangles of color along one side. In her work, Tafoya uses various kinds of shell, turquoise, alabaster, gaspeite, jet, black jade, pipestone, and more. 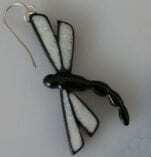 Various of these materials are represented in these earrings. Earrings are 1 5/8 in. high x 3/8 in. wide x 1/8 in. thick. Mary Tafoya Side Mosaic Earrings Mary Tafoya creates innovative designs in mosaic which sets her apart from most other Santo Domingo pueblo artists. In addition to design quality, the use of jet in her adhesive creates a wonderful contrast of black with materials. of many colors. 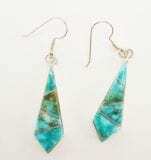 These beautifully colored earrings consist of a centerpiece stone with small rectangles of color along one side. In her work, Tafoya uses various kinds of shell, turquoise, alabaster, gaspeite, jet, black jade, pipestone, and more. 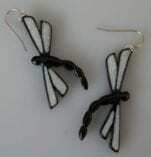 Various of these materials are represented in these earrings. Earrings are 2 in. high x 1/2 in. wide x 1/8 in. thick. Mary Tafoya Side Mosaic Earrings Mary Tafoya creates innovative designs in mosaic which sets her apart from most other Santo Domingo pueblo artists. In addition to design quality, the use of jet in her adhesive creates a wonderful contrast of black with materials. of many colors. These beautifully colored earrings consist of a centerpiece stone with small rectangles of color along one side. In her work, Tafoya uses various kinds of shell, turquoise, alabaster, gaspeite, jet, black jade, pipestone, and more. Various of these materials are represented in these earrings. Earrings are 13/16 in. high x 1/2 in. wide x 1/8 in. thick. Mary Tafoya Side Mosaic Earrings Mary Tafoya creates innovative designs in mosaic which sets her apart from most other Santo Domingo pueblo artists. In addition to design quality, the use of jet in her adhesive creates a wonderful contrast of black with materials. of many colors. These beautifully colored earrings consist of a centerpiece stone with small rectangles of color along one side. In her work, Tafoya uses various kinds of shell, turquoise, alabaster, gaspeite, jet, black jade, pipestone, and more. Various of these materials are represented in these earrings. Earrings are 7/8 in. high x 1/2 in. wide x 1/8 in. thick. Mary Tafoya Stacked Earrings Mary Tafoya creates innovative designs in mosaic which sets her apart from most other Santo Domingo pueblo artists. In addition to design quality, the use of jet in her adhesive creates a wonderful contrast of black with materials. of many colors. These beautifully colored earrings consist of carved stone stacked vertically. They are backed by dark serpentine stone, another of Tafoya's unique touches. In her work, Tafoya uses various kinds of shell, turquoise, alabaster, gaspeite, jet, black jade, pipestone, and more. Various of these materials are represented in these earrings. 1 in. high x 1/4" wide x 1/4" thick. Mary Tafoya Side Mosaic Earrings Mary Tafoya creates innovative designs in mosaic which sets her apart from most other Santo Domingo pueblo artists. In addition to design quality, the use of jet in her adhesive creates a wonderful contrast of black with materials. of many colors. These beautifully colored earrings consist of a centerpiece stone with small rectangles of color along one side. In her work, Tafoya uses various kinds of shell, turquoise, alabaster, gaspeite, jet, black jade, pipestone, and more. Various of these materials are represented in these earrings. Earrings are 1 3/16 in. high x 9/16 in. wide x 1/8 in. thick. Mary Tafoya creates innovative designs in mosaic which sets her apart from most other Santo Domingo pueblo artists. In addition to design quality, the use of jet in her adhesive creates a wonderful contrast of black with materials. of many colors. Each of these beautifully colored earrings consists of a centerpiece stone with small rectangles of color along one side. In her work, Tafoya uses various kinds of shell, turquoise, alabaster, gaspeite, jet, black jade, pipestone, and more. Various of these materials are represented in these earrings. Earrings are 7/8 in. high x 3/8 in. wide x 1/8 in. thick.